Are you suffering from pink, light brown or white spots on your skin? Watch out, for these may just be the signs of an underlying fungal infection. Read and know all about Tinea versicolor including its causes, symptoms, diagnosis and treatment. 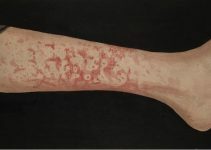 1 What is Tinea versicolor? 3 How Do You Get Tinea versicolor? 5 Who Gets Tinea Versicolor? 6 Is Tinea Versicolor Contagious? The infection is generally marked by the development of small spots over the skin surface. The cutaneous spots can be small, oval or round in shape. These are found to arise on oily skin regions on the back, upper arms or upper chest. In some people, these also originate on the face, neck and upper thighs. The spots may also be tanned in appearance. In each affected individual, a spot can be of only one color. The skin over the blemishes may have fine scales and sharp edges (borders). The blotches may appear lighter (Hypopigmented) or unusually darker (Hyperpigmented) than their adjoining skin region. This is particularly common in individuals of African-American descent. People, who have a lighter complexion during winter, may fail to notice the blemishes altogether in case they are lighter in color. Individuals, whose skin become darker on exposure to sunlight, may have noticeable blemishes as they fail to tan with the rest of the skin area. Over time, these small spots may develop into patches. Some people, affected by this infection, also suffer from itchiness in the spots when they go out into sunny environs. Itchy symptoms may also arise if their body temperature is hot, particularly after an intense workout. Those who sweat a lot can also suffer from itchy sensations in the areas where maculae arise. 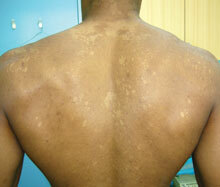 Discolored tinea versicolor rashes tend to have a slow growth and may give rise to mild itchiness. How Do You Get Tinea versicolor? This is a relatively common disease and is caused by an overgrowth of Pityrosporum ovale, a variety of yeast that is usually found in the pores of the human skin, particularly the oily regions of the body. The presence of this fungus is non-threatening and causes problems only in some cases. The discoloration of skin is usually more apparent after exposure to the sun. A period of sun-bath tans the unaffected skin but not the discolored patches, creating a visible difference. The maculae of this infection have been attributed to a rise in body temperature. The rashes are typically found to occur in people living in regions with hot climatic conditions. However, the spots are also found to occur more in individuals who sweat excessively. An intense episode of work-out is seen to give rise to these patches suddenly. The infection occurs more commonly in teenagers and young adult males. This is primarily supposed to be a result of hormonal changes occurring at this age. A defect in normal functioning of the immune system reduces the natural ability of the body to protect itself from an overgrowth of yeast as well as other types of fungi. The infection can affect people of any age group. However, it is more common in adolescents and young adults. It is also extremely common in individuals residing in warm, humid conditions. There is also a spurt of this condition during the summer months. Healthy skin has also been found to harbor the yeast that causes Tinea Versicolor. Due to this, it becomes very difficult to predict who can be affected by this disease. However, people who have an oily skin and sweat excessively are more prone to contracting this infection. This infection is not contagious. However, it often recurs in many patients within a span of one to two years. Once cured, discolored spots may fade away in anywhere from six weeks to six months. Doctors are often able to confirm the presence of this condition by simple physical observation of the spots. A standard procedure, known as Skin Scraping Test, may also be used for diagnosis. The process involves taking a small scraping (sample) from the skin. A drop of Potassium Hydroxide (KOH) is poured over this skin spot, which is then examined under a microscope. Microscopic examination reveals the presence of yeast forms and confirms whether fungal infection is the underlying cause. The infection can be treated through various methods, which involve over-the-counter (OTC) remedies, medications, natural treatment, herbal remedies and home remedies. OTC treatment is, however, not very effective and can give rise to side effects. Shampoos create many problems, including irritation. These may also miss spots that are difficult to reach. Topical creams that come in small tubes can be less effective on larger skin regions affected by this infection. These antifungal pills are considered to be effective, but can produce side effects if not administered in a proper dose. The dosage varies for each medicine. Ketoconazole has a single dose while Itraconazole should be taken in through five doses on a daily basis. The dosage for Fluconazole varies as per the severity of the infection. These drugs, like any other medicine, may produce side effects. Due to this reason, patients need to have a full consultation with their doctors regarding the symptoms that the drugs may cause. It is for this reason that topical treatments are regarded as safer than antifungal medications as they only target the skin. Garlic is an important food that is popular as an antifungal agent. Consumption of large amount of raw fruits can supply the body with antioxidants and boost the immune system. Regular intake of citrus fruits as well as juices of other fruits can also improve immunity and cure the problem. Intake of dry fruits, such as dates, almonds and figs, can increase the hemoglobin rate and make the human body more resistant to disorders. Leafy vegetable should be a part of the regular diet of patients of this infection. Raw vegetables and whole grains, if consumed in substantial amounts, can also boost the immune system of sufferers and ensure a faster recovery. Honey improves blood flow in the body. Taken in any form, it can have significant effects on the human body. Cloves are reputed for their powerful antifungal properties. Chewing cloves on a regular basis can help reduce fungal infection and cure the problem. Drinking plenty of water and other liquids can greatly improve the condition and prevent Tinea Versicolor recurrence. Keeping the skin dry and clean can help sufferers achieve a faster relief from the infection. Patients should also take a shower more frequently during very hot, humid summer months. Sufferers should strictly avoid sugar, white flour and oily foods in their diet. Many herbs, such as Oregano oil, mint, thyme and tea tree oil, have anti-bacterial, anti-fungal and anti-viral properties. These are available in oil extracts and can be purchased at natural food centers. Any or all of these extracts can be used for remedy. A cotton ball, dampened with this oil, should be gently rubbed directly over the affected region as well as in a one inch radius all around the spot. This should be repeated every day until skin color returns to normal. Most of the pills, creams and shampoos consist of toxic chemicals that may result in unpleasant side effects. Natural home remedies do not cause such effects but can be as effective as chemicals. Yogurt help neutralize the yeast that causes the infection. It also helps maintain the level of bacteria and prevents infection from spreading. Due to these reasons, applying fresh, unflavored yogurt on the infected patches can be quite effective. It is one of the best treatments for Tinea versicolor and often cures the problem permanently, but can take a long time to work. Vinegar contains oregano and garlic which have strong antifungal properties. Gently rubbing affected skin areas with washcloths or cotton balls soaked in vinegar can restore normalcy to skin pigment. The process must, however, be performed daily for several months to show effects. It is one of the most effective treatments for Tinea Versicolor. Tea tree oil has antifungal properties and dries up excess oil on the skin naturally. Soak a cotton ball or washcloth with this oil. Apply it over the patches as well as the external skin area around the spots. Stick a gauze strip to the patch with medical tape. Let the oil soak into the skin for a minimum one hour before taking the gauze off. Remove the oil by taking a shower or cleaning with alcohol. If not removed, the oil can leave stain on clothes. Make a paste by mixing turmeric powder with sandalwood powder and clarified butter. Apply this to the spots for at least 30 minutes. Perform this process on a daily basis until the spots are no longer visible. Natural home remedies take a long time to cure the infection. They do not provide a fast relief that medications and over-the-counter treatments promise. However, they are effective in giving a permanent relief to sufferers. This infection shows a good response to prescription medicines and over-the-counter remedies. However, changes in pigment may linger for several weeks even after the overgrowth is destroyed. Some patients suffer from a recurring infection during the summer months that can be treated with prescription drugs after every two weeks or every month. Individuals with a history of this condition should try to avoid sweating or going out in hot weather conditions. They should make dietary modifications to incorporate more fruits and vegetables into their diet and improve their immunity. They must also take showers everyday and wash their clothes and washcloths in hot water to remove any traces of fungus. 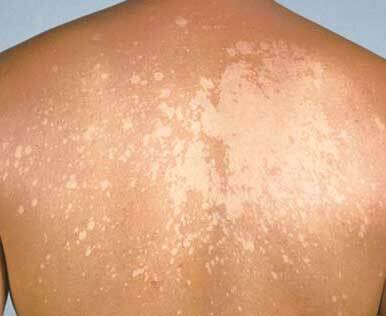 Patients with Chronic Tinea Versicolor should dry-clean their clothes or wash them in very hot water. Some doctors believe that recurrence of the infection can occur due to staying on of fungi in clothing. Using antifungal skin creams, lotions or shampoos at least once a month can help prevent the development of this infection. It is also a good option to consult with a doctor and take antifungal pills once every month. This is found to produce effective results in some cases. Are you curious to know what does Tinea Versicolor look like? Take a look at these Tinea Versicolor photos to get an idea about the visual appearance of these blisters. You will find these Tinea Versicolor images quite useful for reference. If you suspect yourself to be having symptoms of Tinea Versicolor, fix an appointment with your health care provider. Timely diagnosis and treatment can help you make an early recovery from this discomforting disease.